This wasn't supposed to be a hiking day. I was on my way to my cousin's house where eight of us were converging for a 5-day bike ride from Monterey to Santa Barbara, but couldn't resist the opportunity to tag a few summits in Alameda County while I was on my way. It was hot and oppressive July weather and not really the best time to be out hiking in the area, at least in the warmest part of the afternoon, but what can you do? Take what you can get. 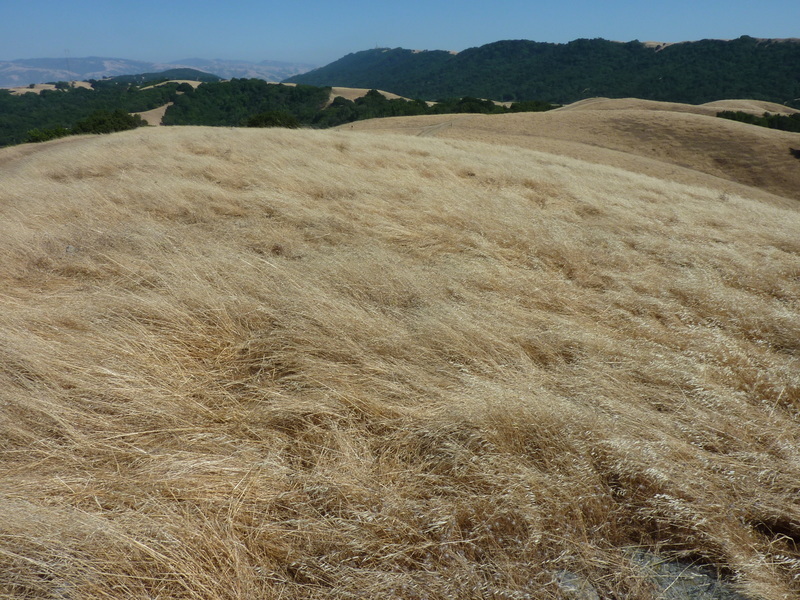 This is the highest point in the northern part of Pleasanton Ridge Regional Park, SW of the 580/680 interchange. One can legally hike to the top from within the park, but it is a long, 14-15mi roundtrip effort that I really didn't want to entertain this afternoon. Instead, I thought I might be able to use some ranch roads from the north to reach the park and Main Ridge. My first effort was to drive to the south end of Blessing Drive in a newish neighborhood where I found a gate and No Trespassing signs as expected, leading into the adjacent ranch. The road did not look little-used as I'd hoped and I could see a gazebo up on the hill to the west and a maintained building to the southeast. This was more a nighttime effort, I thought, and drove off with the intention of giving up. On my drive down the hill, I discovered The Preserve Staging Area off Laurel Creek Drive and thought maybe this would work. It did.